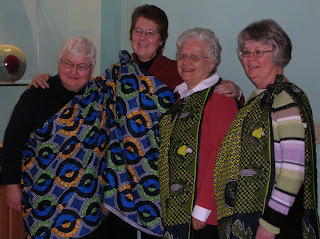 Four sisters who will be traveling to Benedictine communities in Tanzania this summer as part of the AIM USA African Women's Commission, were at the Mount this weekend for an orientation to their upcoming (ad)venture. They will be sharing topics on monastic spirituality and helping with English, as well as simply sharing daily life with their Benedictine sisters. Here they pose in their new kangas: left to right, Dianne Maresh, OSB, Crookston, MN; Bonita Gacnik, OSB, Yankton, SD; Kathryn Huber, OSB, Ferdinand, IN; Norma Reiplinger, OSB, Rock Island, IL. 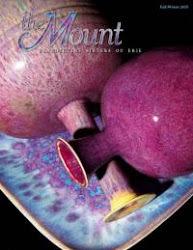 The annual March Art Show opened at the Mount Sunday. I hope to share one piece from it with every entry this month. 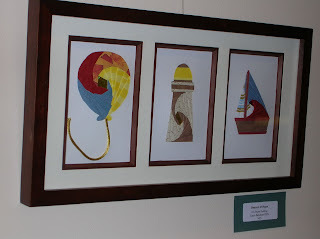 Here are three intricate paper folding pieces from Laura Beichner, OSB. It's hard to tell from this photo, but they are all three-dimensional, coming outward about 1/8" from the vertical surface. (If you click on the photo you can see them up close). New: Morning-Evening Prayer for Lent (see sidebar).